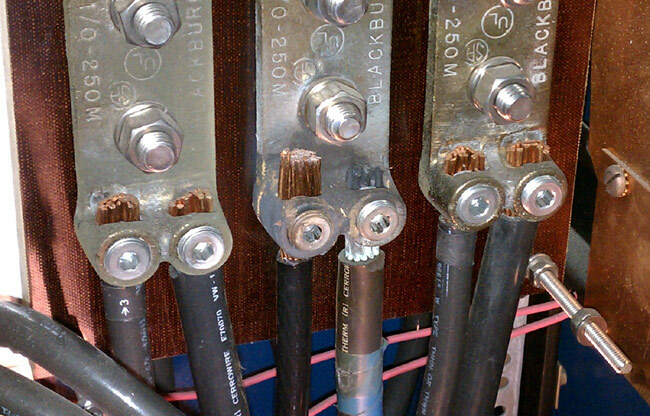 One of the mains phases (middle) in the high voltage supply appears to be heating up, likely due to a loose connection. I checked and re-tightened all of the mains connections. Apparently, this is an old problem, as the Allen screw was tight. Interestingly, the fuse that was blown was on the red phase, which is different from what it was last time. I spent the afternoon filing and sanding off the arc track marks in the PA cavity. It is very important to file flat all sharp points that where the result of arcing. Any sharp points will induce corona. I also filed down all of the contacts in high voltage contactor, which took a fair amount of time. These are soft copper shoes and bars which had so much pitting and carbon I wonder how they didn’t catch on fire. I filed them flat. We were back on the 35A transmitter at full power by 4:30pm. If this happens again, I will bring my megger out and check the insulation on the wire between the disconnect switch and the HV power supply. When I left the site at 5:30, I felt like we did some good work.